With dozens of yield monitors available, precision agriculture is like the Wild West with no standard data format. As a result, farmers and seed companies find it difficult to use yield data to improve cropping decisions. MyFarms solves this problem by converting data from any yield monitor into a standard format in order to create smarter farming decisions. Yield maps have far more productivity information than soil type maps. Next time you create a cropping plan, each zone in your yield map will automatically be categorized as a high, medium, or low yield environment. This positions offensive products on your most productive land and defensive products on your least productive land. 5. 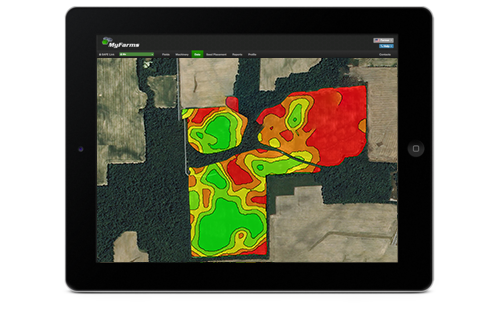 View, download, and put your new yield maps to work! If you use variable rate seeding technology, MyFarms can create management zones and calculate the best planting rate for each acre and product combination. This approach contrasts the recent trend of input suppliers entering the software business. Many of these companies are eager to control as much yield data as possible, which causes anxiety among many farmers. From our point of view, yield data reflects the top line revenue on each field and should be handled with great care. We suggest caution when dealing with those who seek to manage your yield data one year and then price your inputs the next, since the former could be used to inform the latter.